Life’s most awesome event is death, and death comes to us all without regard to wealth, beauty, intelligence, or fame. Buddhist teaching states that, although death is inevitable, how we die-terrified and confused, or with confidence and spiritual mastery-is within our control. Phowa deals directly with our fear of death and our aspiration for enlightenment. Phowa, or “transference of consciousness,” is the Tibetan Buddhist method for attaining a better rebirth, liberation, or enlightenment at the moment of death or in the after-death Bardo. Sufficiently accomplished practitioners may also use this uncomplicated and powerful method for the benefit of other persons and animals who have reached the end of their present life. Tibetans consider it extremely important to perform Phowa for the dying and recently deceased. The verse, “Great is the matter of Birth and Death” is written on the wooden block that is struck to summon Zen monks to meditation. Phowa goes directly to the heart of the matter. Fear of death is a gateway that leads many to the study and practice of Dharma. Phowa can appeal to those who, although ignorant of the vast traditions of Dharma, have a natural concern about their future death. Additionally, some of the signs of accomplishment of Phowa practice are physical and visible and often appear after only a short time of practice. Perhaps no Tibetan lama is more identified with the transmission of Phowa to the West than His Eminence Ayang Rinpoche. 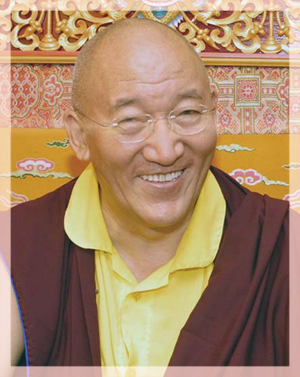 Ayang Rinpoche is a Drikung Kagyu lama who holds both Nyingma and Drikung lineage. He continues the unbroken line of succession of the Drikung Phowa lamas from the Supreme Guru Dorje Chang to the present time. He has done extensive retreat on Phowa practice and is widely recognized as a Phowa master. A delegation of high lamas , including the Sixteenth Gyalwang Karmapa Rangjung Rigpe Dorje and Yongzin Jabra Rinpoche, concluded that Ayang Rinpoche was the wisdom incarnation of Terton Rigzin Choegyal Dorje. In 1982 HH Dalai Lama and HH Karmapa each requested Ayang Rinpoche to travel to “the Western countries” and there teach Phowa. Interestingly, both great lamas independently gave Rinpoche similar advice. Both stated that, because Dharma is not part of the cultural heritage of the West, Westerners usually lack faith in the power of Dharma. They said that Phowa’s effect of quickly producing physical signs in the practitioner’s body would help give the materialistic European or American student confidence in Dharma. And, increased faith would serve to encourage sincere Western students to practice virtue. However, Ayang Rinpoche expressed one concern. Would people benefit? Phowa is one of the Six Yogas of Naropa. This body of practices-advanced tantric teachings that apply powerful liberated technique to each of the six bardos (Phowa corresponds to the bardo of the moment of death)-is rarely taught before the practitioner has completed the foundation practices (Ngondro). Nonetheless, both HH Dalai Lama and HH Karmapa assured Ayang Rinpoche that his teachings would be of benefit to the people of the West. Ayang Rinpoche has since stated that Phowa is like an insurance policy: if one has realized Mahamudra, there is no problem at death, but if one’s practice is not complete Phowa is very useful. However, the Phowa itself requires commitment. Should the Phowa be attempted without the vital precaution of an initiation from a lineage holder, the results will not be the same, and the practitioner will be faced with dangers. With initiation, instruction and correct practice the blessings of the lineage will flow unhampered to the disciple, bringing quick results. The blessings of this lineage are so effective that many received physical signs of accomplishment quickly-after a brief period of practice or even during the oral transmission of the text. In the words of Marpa, the Translator, “If you study Phowa, then at the time when death is approaching you will know no despair. If beforehand you have become accustomed to the Path of Phowa, then at the time of death you will be full of cheerful confidence.” It is taught that one does not return to the samsaric realms after having entered Dewachen, and that one can quickly and easily achieve enlightenment from that Pure Land. The Phowa teachings are extensive, detailed, and articulate effective practices for practitioners of different capacity. There is Dharmakaya Phowa, Sambhogakaya Phowa and Nirmanakaya Phowa. Consequently, Phowa provides means by which liberation can be attained by people of good roots who may lack extensive Dharma experience. Phowa provides a skillful technique by which beings of varying inclinations can connect with the infinite blessing power of the Buddha of Infinite Light, Amitabha. To connect with Buddha Amitabha is to partake in his vow that all beings, even the grossly deluded, who have faith in him can attain to his Pure Land. This is the source of Phowa’s efficacy.